A pessimist might see the American Mountain Guides Association (AMGA) facing some serious growing pains. And, yes, the non profit which sets the standard for mountain guides in the U.S, does have to face some big challenges including how to grow membership and address access on public lands as well as a looming controversy over scope-of-practice policy. But newly elected board president, Angela Hawse only sees solutions and soon-to-be successes. “I’m going to dig in and find each board member’s strength, and we’re going to play to that,” she promises. Believe her. Based in Ridgway, Colorado, the 55-year-old Hawse, has built a celebrated career with this get-it-donemindset. 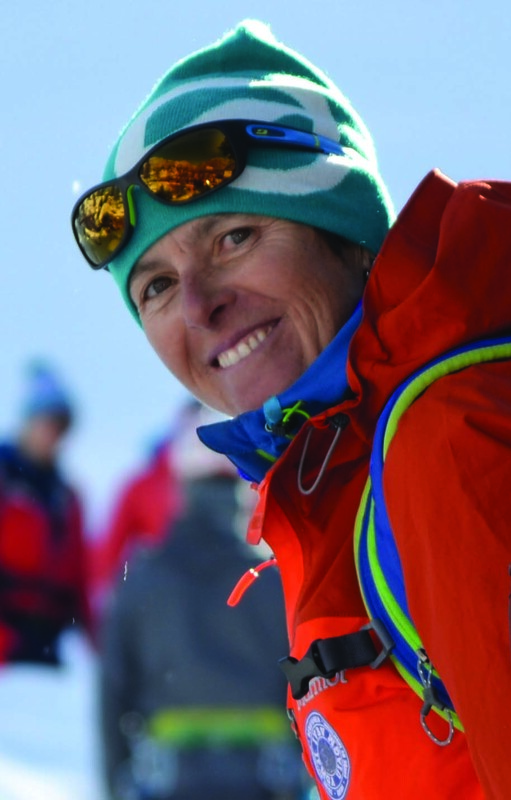 She was the sixth American woman to achieve International Federation of Mountain Guides Associations (IFMGA) certification. She was the first woman to join the instructor team at the AMGA and won its 2011 Guide of the Year. She’s led expeditions in the Himalaya (summiting Ama Dablam and missing Everest by just 275 feet), holds a master’s in International Mountain Conservation from Prescott College and heli-guides for HeliTrax in southern Colorado. She’s also one of the few Americans to complete a professional Level 2 avy course in Canada. She’s also socially conscious, raising $20,000 for a girls’ safe-house project in Sikkim, India, for example, during one of her expeditions there. She also participated in getting the first adaptive climber (Tom Whitaker) to the summit of Mount Everest in 1998, as well as removing thousands of pounds of garbage from the peak (including o2 bottles, human waste, fuel canisters, and batteries). I catch up with Hawse at her home in Ridgway. She’s just returned from examining candidates in rock climbing for the AMGA (she’s “tough but fair” according to a former student and examinee) and now she’s packing to lead a ski expedition in Antarctica. I ask her about the issues facing the AMGA, which awards the highest level of guding certification in the U.S. as well as advocating for guides and acess to climbing. The AMGA’s efforts to codify a scope of practice (SoP) for mountain guides in the U.S. has been a sticky issue. The organization has introduced specific guidelines for routes and terrain in which guides of differing levels of certification can work. This has made waves within the community, as guide services and other organizations like NOLS and Outward Bound, have considered the SoP’s effect on their activities and labor pool. There’s big money, big egos and big changes in the mix, which only motivates Hawse. It’s a literal accounting of how she’s overcome the physical stressors of a career guiding on rock, snow, and ice; but it’s also a metaphor for how she’s thrived in a profession overwhelmingly dominated by men. Consider that only nine percent of U.S. IFMGA mountain guides are women (though that figure vastly eclipses countries like France, which claims just two percent). And how about as a female mountain guide?